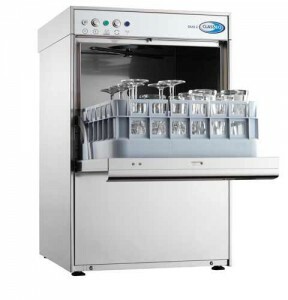 We were contacted by a Restaurant who had a Duo 2 under counter glass washer which was tripping the RCBO (Mains electric power supply), and also wanted a new 8 litre manual water softener fitted. Our expert engineers were on site within 24 hours. The initial work carried out required electrical diagnostics to find the fault tripping the electric supply. The wash pump seals were leaking causing cables to be wet, this was the fault. The wash pump now needed to be replaced, which would have caused a big disruption in the small bar area, in service time. To remove and refit a wash pump requires access to the front and rear of the Glass washer. Luckily because the weather was nice they removed the Glass washer outside into the rear service courtyard, where there was plenty of room to carry out the repair. Once finished they reinstalled the machine with the new softener, then checked everything was in good working order. Response Time: Within 24 hours, machine up and running again. Client feedback: Very happy with the service provided.